Explore hidden gems such as High Desert Museum and Oregon Trail of Dreams. Get in touch with nature at Smith Rock State Park and Pilot Butte State Scenic Viewpoint. You'll find plenty of places to visit near Bend: Hoodoo Ski Area (in Sisters), Crescent Moon Ranch (in Terrebonne) and The Office Bridge (in Westfir). There's much more to do: hit the slopes at Mt. Bachelor Ski Area, learn about winemaking at Maragas Winery, explore the wealth of natural beauty at Deschutes National Forest, and get impressive views of Newberry National Volcanic Monument. To see where to stay, maps, reviews, and other tourist information, you can read our Bend trip maker . Madison to Bend is an approximately 10-hour flight. You can also do a combination of bus and flight; or drive. The time zone difference moving from Central Standard Time (CST) to Pacific Standard Time (PST) is minus 2 hours. Expect somewhat warmer weather when traveling from Madison in December: highs in Bend hover around 40°F, while lows dip to 22°F. Finish up your sightseeing early on the 2nd (Thu) so you can go by car to Newport. You'll get in some beach time at Devils Punchbowl State Natural Area and Heceta Beach. Step off the beaten path and head to Yaquina Head Outstanding Natural Area and Heceta Head Lighthouse. Change things up with these side-trips from Newport: Sandland Adventures (in Florence), Yachats (Cape Perpetua Visitor Center - Siuslaw National Forest, Smelt Sands State Park, & more) and Taft Bay (in Lincoln City). The adventure continues: enjoy the sea views from Yaquina Head Lighthouse, get up close to creatures of the deep with a dolphin and whale watching tour, take a leisurely stroll along Newport's Historic Bayfront, and enjoy the sand and surf at Driftwood Beach State Recreation Site. For other places to visit, maps, where to stay, and other tourist information, read Newport journey planner. Getting from Bend to Newport by car takes about 4.5 hours. Other options: take a bus. In January, Newport is a bit warmer than Bend - with highs of 51°F and lows of 40°F. Cap off your sightseeing on the 8th (Wed) early enough to go by car to Portland. You'll explore the less-touristy side of things at Mt. Hood Meadows and Willamette Valley Vineyards. Get outdoors at Timberline Lodge and Ski Area and Mount Hood. Explore Portland's surroundings by going to Silver Falls State Park (in Silverton), Mt. Hood National Forest (in Welches) and Mount Angel (St. Mary's Catholic Church & Queen of Angels Monastery). There's much more to do: contemplate the long history of Pittock Mansion, don't miss a visit to McLean House, shop like a local with Northwest (Nob Hill), and hike along Forest Park. To see more things to do, traveler tips, photos, and more tourist information, use the Portland day trip planning site . Getting from Newport to Portland by car takes about 3 hours. Other options: take a bus. In January, Portland is little chillier than Newport - with highs of 46°F and lows of 35°F. Finish your sightseeing early on the 15th (Wed) so you can drive to Astoria. 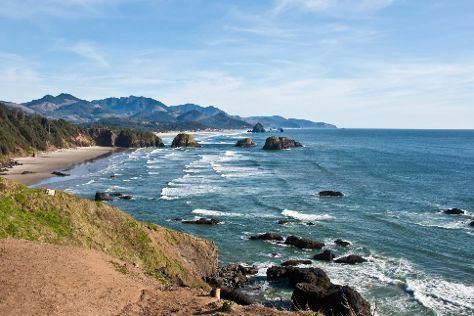 We've included these beaches for you: Cannon Beach and Hug Point State Recreation Site. Step out of the city life by going to Astoria Column and Columbia River Maritime Museum. Explore Astoria's surroundings by going to Cannon Beach (Ecola State Park & Haystack Rock), Manzanita (Manzanita Beach & Short Sands Beach) and Cape Meares Lighthouse (in Tillamook). Spend the 17th (Fri) exploring nature at Fort Clatsop National Memorial. There's much more to do: immerse yourself in nature at Fort Stevens State Park, contemplate the long history of Battery Russell, enjoy the sand and surf at Long Beach, and explore the wealth of natural beauty at The Lewis And Clark National And State Historical Parks. To find reviews, photos, more things to do, and other tourist information, read our Astoria road trip website . Traveling by car from Portland to Astoria takes 2 hours. Alternatively, you can take a bus; or do a combination of train and bus. In January, daily temperatures in Astoria can reach 50°F, while at night they dip to 38°F. 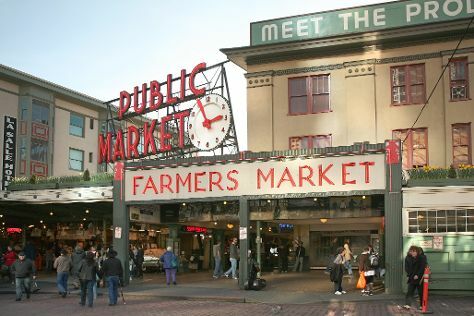 Finish your sightseeing early on the 22nd (Wed) so you can drive to Seattle. Eschew the tourist crowds and head to Snoqualmie Falls and Fort Worden State Park. Take a break from the city and head to Nisqually National Wildlife Refuge and Alpental Ski Area. Explore the numerous day-trip ideas around Seattle: Point Defiance Park (in Tacoma) and Point No Point Lighthouse & Park (in Hansville). The adventure continues: wander the streets of Pike Place Market, stroll through Kerry Park, shop like a local with Pioneer Square, and admire the landmark architecture of Sky View Observatory. To see where to stay, maps, traveler tips, and tourist information, you can read our Seattle trip planner. Drive from Astoria to Seattle in 3.5 hours. Alternatively, you can do a combination of bus and train; or do a combination of bus and flight. In January in Seattle, expect temperatures between 48°F during the day and 38°F at night. Wrap up your sightseeing on the 28th (Tue) to allow time to travel to Sanibel Island. St. Isabel Catholic Church and Sanibel Historical Museum and Village will appeal to history buffs. Eschew the tourist crowds and head to Fishing Charters & Tours and Pond Apple Park. There's lots more to do: tour the pleasant surroundings at Captiva Beach, look for all kinds of wild species at Sanibel Captiva Conservation Foundation, gain insight at Clinic for the Rehabilitation of Wildlife (CROW), and admire the natural beauty at In The Garden. To find photos, more things to do, other places to visit, and tourist information, use the Sanibel Island journey website . You can fly from Seattle to Sanibel Island in 9.5 hours. Alternatively, you can do a combination of flight and bus; or drive. The time zone difference moving from Pacific Standard Time to Eastern Standard Time is 3 hours. Traveling from Seattle in January, you will find days in Sanibel Island are much hotter (75°F), and nights are a bit warmer (56°F). Finish your sightseeing early on the 3rd (Mon) to allow enough time to drive to Marco Island. Marco Island is a city in Collier County, Florida, United States, located on an island by the same name in the Gulf of Mexico off the coast of Southwest Florida. You'll discover tucked-away gems like Fishing Charters & Tours and South Marco Beach. Deepen your sense of the past at sights like Smallwood Store and San Marco Catholic Church. Go for a jaunt from Marco Island to Everglades City to see Nature & Wildlife Tours about 36 minutes away. There's much more to do: take a tour by water with Boat Tours & Water Sports, tour the pleasant surroundings at Canine Cove, contemplate the waterfront views at Capri Paddlecraft Park, and identify plant and animal life at Wildlife Areas. To see reviews, other places to visit, traveler tips, and other tourist information, you can read our Marco Island tour itinerary planning site . Traveling by car from Sanibel Island to Marco Island takes 1.5 hours. February in Marco Island sees daily highs of 77°F and lows of 59°F at night. Finish your sightseeing early on the 9th (Sun) to allow enough time to drive to Naples. Naples is a city in Collier County, Florida, United States. Explore hidden gems such as Barefoot Beach Preserve and Dolphin & Whale Watching. We've included these beaches for you: Lowdermilk Beach and Clam Pass Park. Change things up with these side-trips from Naples: Fort Myers Beach (Parasailing & Paragliding & Lovers Key State Park), Koreshan State Park (in Estero) and Fort Myers (Six Mile Cypress Slough Preserve & List Distillery). The adventure continues: get a new perspective on things with Boat Tours & Water Sports, do a tasting at The Naples Winery, trek along Kirby Storter Roadside Park, and take in the architecture and atmosphere at Celebration Community Beach Church. For where to stay, other places to visit, and more tourist information, refer to the Naples trip itinerary planner . Naples is just a short distance from Marco Island. In February, daytime highs in Naples are 78°F, while nighttime lows are 60°F. Cap off your sightseeing on the 16th (Sun) early enough to go by car to Sarasota. Sarasota is a city in Sarasota County on the southwestern coast of the U.S. Escape the urban bustle at Tampa Electric's Manatee Viewing Center and Bean Point. Your itinerary includes some good beach time at Caspersen Beach and Crescent Beach. Change things up with these side-trips from Sarasota: Englewood (Englewood Beach, Stump Pass Beach State Park, & more), Bradenton Beach (in Bradenton Beach) and Bradenton (De Soto National Memorial & Robinson Nature Preserve). And it doesn't end there: admire the natural beauty at Marie Selby Botanical Gardens, take in the architecture and atmosphere at Our Lady of Lourdes, stroll through Venice Beach, and kick back and relax at Siesta Beach. Ask Inspirock to suggest an itinerary and make planning a trip to Sarasota fast, fun, and easy. You can drive from Naples to Sarasota in 2 hours. Alternatively, you can take a bus. Expect a daytime high around 75°F in February, and nighttime lows around 56°F. Finish your sightseeing early on the 23rd (Sun) to allow enough time to travel back home.